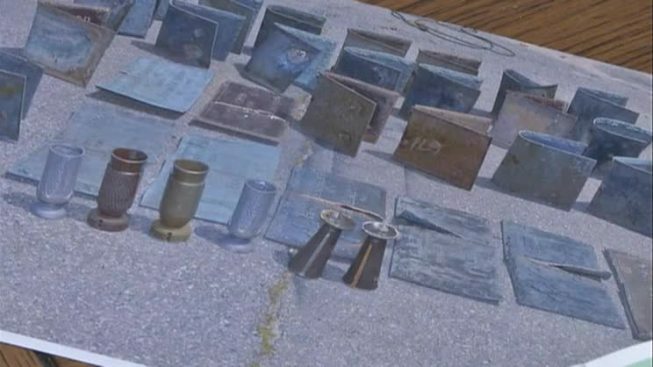 A Rhode Island man is expected to be arraigned Thursday after he and another man allegedly stole more than $20,000 worth of bronze markers and vases from military veterans' graves at a cemetery in West Warwick. Police say Robert Haney of West Warwick and Michael Gilligan of Providence pried the markers from Saint Joseph Cemetery and sold them to J & S Scrap Metal in Johnston. Police were able to recover the items and identify the suspects based on surveillance video at the scrapyard. "Senseless, really, really senseless. Some things should be left untouched. Cemeteries and cemetery markers should be one of those things," Johnston Deputy Police Chief Daniel Parrillo said. The markers are badly damaged and likely can't be put back on the graves, according to police. Haney, 39, and Gilligan, 32, will face felony charges for receiving stolen property and conspiracy.